Does circumpolar circulation ring a bell? Vortex sounds technical and frightening.... and despite no way of reproducing it with their models, it can be trotted out as the latest CO2 induced bogey-man. Always good for a laugh, at least, is ol' Albert. Does circumpolar circulation ring a bell? Sure does. This article is brief and comprehensible. As temperatures fell, some blamed a mysterious polar vortex, but this is a system of winds in the stratosphere that spins around the Arctic and Antarctic during their respective winters, many kilometres above the weather. There is nothing unusual about the polar vortex, according to the UK Met Office. Instead, cold Arctic air has reached North America thanks to a weakened jet stream – the continent's atmospheric conveyor belt. "Vortex" does sound sexier though. Actually, the simple explanation is that polar bears keep the Arctic warm. have now tipped the globe into catastrophic climate change. Posted: Thu Jan 09, 2014 7:32 am Post subject: Cover-up? Speaking of the polar regions, Arctic sea-ice is on the mend (Death spiral? we don't need no stinkin' death-spiral....) and Antarctic sea-ice is growing as ever. Lots of info on the Turney expedition and how they got stuck in that same sea-ice. for the same date and time. In 2008 central Greenland was very cold but not Siberia or Canada and the 10C isotherm travels to the north of Scotland. north of Scotland but further to the west. little frost or snow there but no exceptional warmth either. warming at the poles so there is clearly something wrong with that theory. However, the sun has been less active of late. 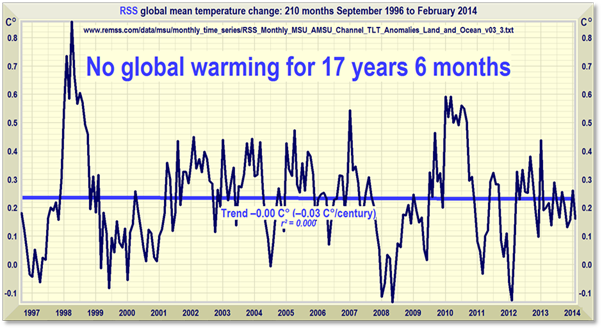 Posted: Monday, February 10, 2014 12:00 am | Updated: 12:02 am, Mon Feb 10, 2014.
to show some slow warming to those depths. begin to cool, perhaps for the next several decades or more. scientists and friends earlier in the Antarctic summer. much quicker than the vast oceans that cover two-thirds of the planet. snowfalls in many areas that hadn't seen such events in modern times. I am just old enough to recall the frigid 50's and the soggy 60's. That 60 year semi-cycle is also somewhat evident in the CET record (Central England Temps) going back to the 1700s. 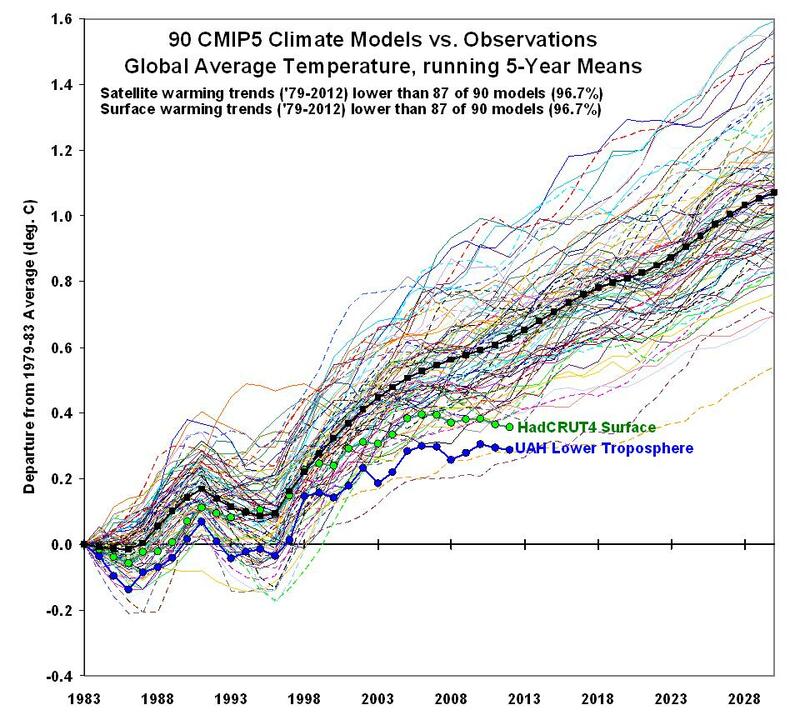 is a good reason to turn down the alarmist scares. Seventeen and a half years. Not a flicker of global warming. 1: This graph is highly topical. It is right up to date. version 4 (HadCRUT4); and the National Climatic Data Center (NCDC). value, for February 2014, became available just hours ago. freezing point of water, or just 2.73 degrees above absolute zero. to be determined: it is 13.82 billion years. 3: The graph is accurate. the data window at both axes so as to show the data at maximum size. Statistics at the University of Melbourne. 4: The graph is news. long hiatus in global warming secret. Nature rules the climate – not Man. Earth will be covered with ice or become hellishly hot. -- whether it’s mainly humans or whether it’s mainly natural. "Food Production Harmed By CO2 & Warmer Temperatures"
The Guardian's sources are "the website Inside Climate News and another crew composed of Los Angeles Times veterans and up-and-comers at the Columbia Journalism School". It was only really around 2007 when the Vostok ice-cores showed that [CO2] FOLLOWED global temperature rises after each ice-age. Clearly, over the past several hundred million years, the earth's temperature has been pretty independant of [CO2]. Other than that, the scam continues apace with CoP Paris on its way. Now, if only the darn temps would rise as predicted....projected...hoped for... oh well, here there are snow flurries today. We could use a little more warmth, even if the extra CO2 has improved our garden's yield. “It’s a fraud really, a fake,” he says, rubbing his head. It’s just worthless words. There is no action, just promises. 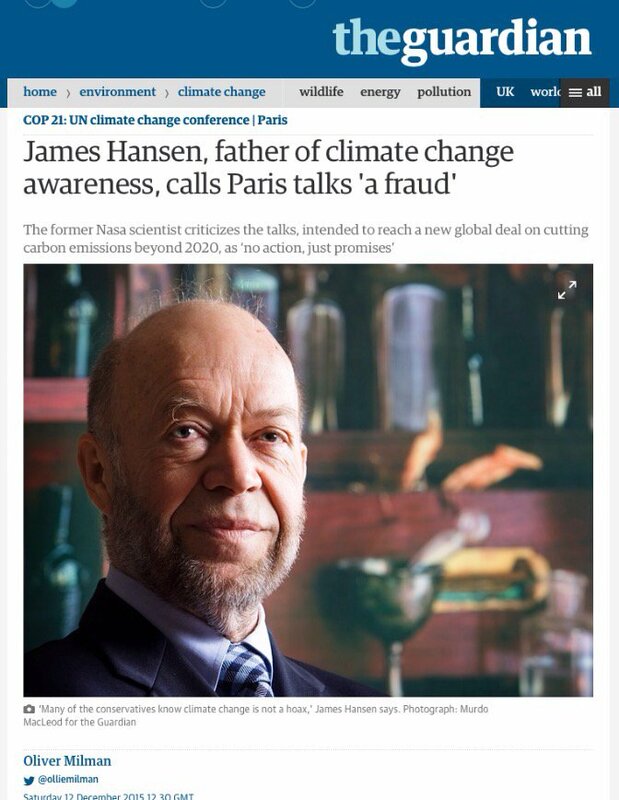 "CLIMATE DEAL IS A WORTHLESS FRAUD"
as if it represented a momentous breakthrough. deal acceptable to all - an elaborate architecture - all facade. We broke the back of those parasitic scum with ClimateGate. The faked data exposed by that hack just shredded their credibility. Today's outcome is a HUGE victory for the TruthSeekers. You won't hear that in the mainstream. So take a bow! Let's hear it for the Chinese ClimateGate hackers who took them out! !